Additional research provided by Dan Blair. Cape Lookout National Seashore encompasses 28,000 acres of land and water and extends for 55 miles along the North Carolina coast from Ocracoke Inlet to Beaufort Inlet. Included within its boundaries are Shackleford Banks, Cape Lookout, Core Banks, and the site of the deserted village of Portsmouth, which was the first town established on the Outer Banks (1753). Established in 1966, the park is one of the most remote of the nation's 10 national seashores and one of the least visited, lacking paved roads, restaurants, hotels, and private residences. It has been described as a vast nature preserve, established to protect one of the few remaining unaltered barrier island systems in the world while at the same time encouraging visitors who are willing to "rough it" in exchange for unique fishing, hiking, swimming, camping, and other outdoor experiences in a completely natural setting. Cape Lookout is entirely different from its sister park to the north, the older Cape Hatteras National Seashore (1953), which is traversed by a modern highway for almost its entire length and has accommodations for thousands of tourists at private facilities in the eight villages within its borders. The headquarters of the Cape Lookout National Seashore is located at the end of the paved road on Harkers Island, east of Beaufort. The National Park Service provides no public access to the park, but passenger ferries from Harkers Island to Cape Lookout, Ocracoke to Portsmouth, and Davis or Atlantic to Core Banks are operated by concessionaires. Vehicular traffic is permitted in certain sections of the park, but only immediately adjacent to the ocean beach or on designated sand trails. A ranger station is maintained at Portsmouth village, where visitors can see the restored church, several residences, and the historic Portsmouth Coast Guard Station. A self-guided walking tour provides information on the history of the village and the individual structures that remain. Portsmouth and Ocracoke Inlet gained prominence in the eighteenth century as the only deepwater port on the northern North Carolina coast. A fort, described as "a fascine battery on pilings," was built there in the 1750s, with a barracks building for housing 40 men, but it was abandoned after brief use. Portsmouth served for many years as an official commodity inspection point, and in 1806, just three years before the official census listed the population of Portsmouth as 387, there was an "academy" in the town. A post office was established at Portsmouth in 1840, the same year that a marine hospital was built there, but that marked the turning point in Portsmouth's fortune. With the opening of nearby Hatteras Inlet, the maritime traffic through Ocracoke Inlet began to decline, as did the population of Portsmouth, but it was more than a century later before the last permanent residents of Portsmouth left the island, leaving behind their homes and family cemeteries. Unlike other sections of the park, Shackleford Banks, which extends from Lookout Light to Beaufort Inlet, is prohibited for vehicular traffic. Until late in the nineteenth century, Shackleford Banks was the location of a community known as Diamond City (because of the distinctive checkered pattern of the nearby lighthouse), and for many years it was the base for shore whaling along the North Carolina coast. Whenever a whale was harpooned and brought ashore, just about everybody in the community, from children to old persons, participated in the activity of cutting up and boiling the blubber in the process of "trying out" the whale oil. Diamond City and Shackleford Banks were abandoned in the 1890s following a succession of disastrous hurricanes, and most of the residents moved to Harkers Island, Salter Path, or a section of Morehead City they called the "Promised Land." Cape Lookout National Seashore. Image courtesy of the National Park Service. Available from http://www.nps.gov/calo/photosmultimedia/photo_scenery.htm (accessed November 20, 2012). 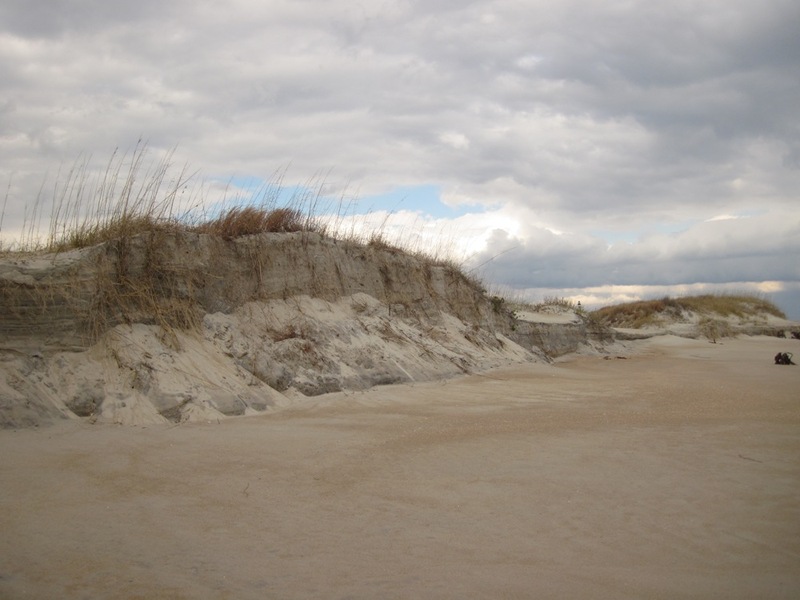 Sand Dunes at the Cape Lookout National Seashore. Image courtesy of the National Park Service. Available from http://www.nps.gov/calo/photosmultimedia/photo_scenery.htm (accessed November 20, 2012). Thank you for sharing these! I will add them as resources for the related entries. If you happen to come across any additional resources for students, please share them.